Back in 2008, I made a cult flyer/gospel tract combo available to the readers of this blog to download for free. Since then, this flyer/tract combo has undergone refinement and is now in its fifth printing. This flyer/tract combo was drafted as a way to inform the public about the truths of the Jehovah’s Witnesses and Mormons, and to provide them with the true gospel of Jesus Christ. It was originally designed to hang on doorknobs in the area where I live and was in response to the constant canvasing of neighborhoods by these two cults. But since its inception, this flyer/tract combo has also found its way into the hands of numerous people throughout America and has even found its way to the shores of Africa (with another box full currently en route to Liberia as I write this). The cult flyer is a single tri-fold (printed on the front and back). The tract comes three to a page (printed on the front and back). Each tract fits nicely inside the cult flyer as an insert. Please feel free to download, print, and make as many copies of each of these items as you wish to distribute as you see fit. You can even put your church name, website, or other personal information on them to help in your evangelistic contacts if you so desire. Who’s Really Knocking at Your Door? 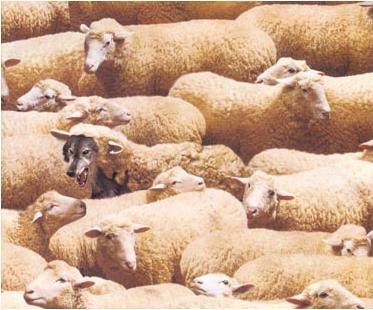 A gospel test for Jehovah’s Witnesses. 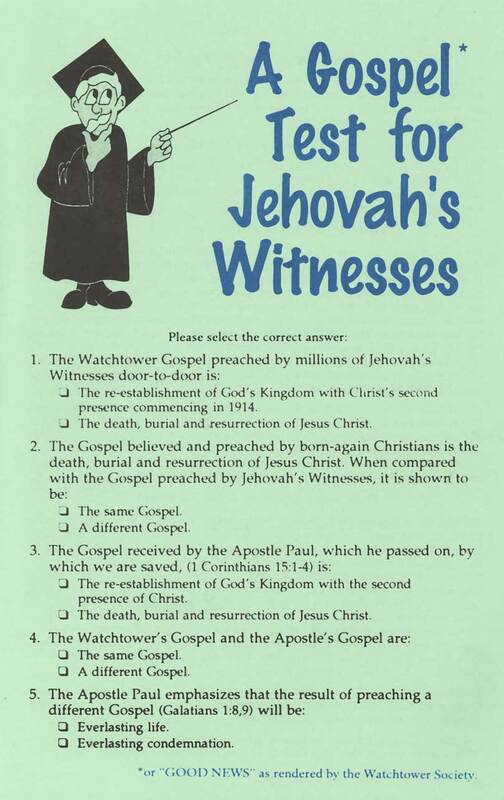 The following five questions for Jehovah’s Witnesses, from a tract sold by Personal Freedom Outreach, is a perfect companion to Paul Washer’s witnessing technique to Jehovah’s Witnesses (found here). Yet another ten (very) quick questions for Jehovah’s Witnesses. You’ve enjoyed Ten (very) quick questions for Jehovah’s Witnesses, Ten more (very) quick questions for Jehovah’s Witnesses and Another ten (very) quick questions for Jehovah’s Witnesses. DefCon presents ten more questions from Keith Walker of Evidence Ministries. Viewer discretion advised on the fourth video below. The false religions and cults simply cannot grasp the simplicity of the gospel message. 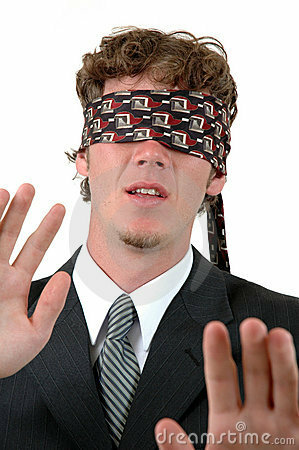 This is evidenced anytime you have a conversation with one of them about sin, grace, faith, and justification. You can go round and round in debate with a member of one of these organizations and you often walk away with a headache because they can’t see the forest for the trees. They have been so indoctrinated to believe their respective organization’s interpretations of biblical texts that when someone presents them with the proper interpretation of biblical texts (using Scripture to interpret Scripture) they simply reject it. It is so sad to watch the deceived continue in their deception, especially when they are leading others down the same broad path. It’s like trying to convince a fish that it’s wet; the fish has known nothing but wet, so it cannot even fathom what dry is. Recently the Jehovah’s Witnesses stopped by my home and dropped off an advertisement with my wife for an upcoming event. They won’t stay to talk (our house has been flagged for almost five years now) but they will occasionally still drop off literature . . . and run. See how subtle their deception is? The obedient don’t need a Savior. Jesus Himself said He came for the sinner, not the righteous (Matthew 9:13, Mark 2:17). This declaration by the Jehovah’s Witnesses is predicated on the erroneous assumption that our obedience is a prerequisite for Christ to be able save us. This is classic Watchtower Organization rhetoric and is essentially the doctrine of all cults and false religions: Believing you must do your part and cooperate with God to help Him or enable Him to save you. 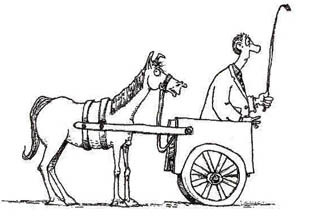 It’s a classic case of putting of the cart before the horse. Our obedience is borne out of a love and desire to please the One who purchased us with His own blood, not out of us trying to appease Him and merit His favor like the pagans try do for their idols. Our obedience, and the good works we do after being saved, come from God and are prepared beforehand for us to walk in (Ephesians 2:10). This is why our behavior should reflect our conversion (Matthew 3:8, Luke 3:8, Acts 26:20, Ephesians 4:1) and why the absence of which should cause us to question whether or not we’ve been genuinely converted. Simply put, regeneration precedes obedience (John 14:15, John 14:21-24, 1 John 3:24). 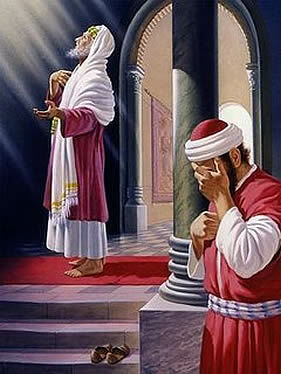 What obedience did Abraham offer to become righteous before God (Genesis 15:6, Romans 4:3)? What obedience did John the Baptist declare to those coming to be baptized (Matthew 3:2)? What obedience did Christ declare upon the start of His earthly ministry (Matthew 4:17) or later in His ministry (Luke 13:5)? What obedience did the thief on the cross exhibit to be with Jesus that very day in paradise (Luke 23:39-43)? What obedience did Paul tell the Philippian jailer he needed to perform to be saved (Acts 16:30-31)? The false faiths that dot the landscape of Christianity like pock marks all invalidate the word of God for the sake of their traditions (Matthew 15:6), and their works-righteousness gospel is in complete contradiction to Jesus’ teaching of the means of the free gift of God’s grace and mercy as cited in His example of the Pharisee and the tax collector in Luke 18:9-14. You cannot read those words of our Lord and still believe that your obedience (or anything for that matter) merits you any favor in God’s eyes. If you still believe otherwise, then you make Christ’s brutal, bloody, and barbaric sacrifice null and void because it was all done in vain. See also: Why Don’t They Get it? Apologizing for believing a lie. A pastor in Kasese District, who claimed the world would end on May 21, has apologised to residents. Pastor Isaac Muhindo, who has since early last year been moving around the district, spreading his doomsday massage, [sic] said he was ashamed of his act. “I want to apologise to the people of Kasese and whoever heard my messages about the end of the world. I am very sorry for the inconveniences because I followed false prophets,” Pastor Muhindo said on Wednesday in his message sent to the media. Many people in the district and the country at large spent the whole of Saturday waiting for the end of the world as presumed by Pastor Herold Camping, a California-based evangelist. Camping’s followers had told people that at 6pm there would be an earthquake that would cause the world to end and usher in Judgment Day. 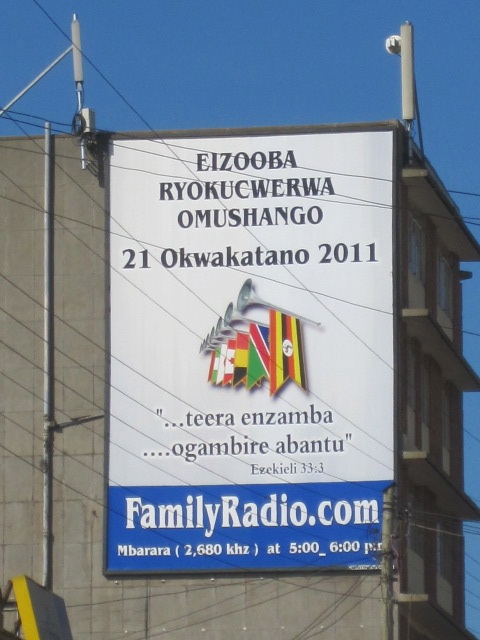 Last year, Pastor Muhindo was denied airtime at most local radio stations in Kasese to preach his alleged end of the world on May 21. Panic gripped some people in Kasese after the predicted doomsday was characterised by a heavy downpour that started at 2pm and ended after 7pm. Ms Gertrude Masika, a shopkeeper in Kasese town, said she did not open her shop on May 21 out of fear that the world would end. “I thought even customers could not come on that day and I decided to remain home because customers were unlikely to appear as they waited to see the end of the world,” she said. Sadly, America has exported many of its homegrown cults to places such as Africa, and Harold Camping is no exception. Thanks to the Africa Center for Apologetics Research for keeping us apprised of this news. May 21, 2011 . . . much to do about nothing. Since Harold Camping is once again predicting Judgment Day to arrive on a specific day (a day that even the Son does not know), I figured I’d turn on Family Radio this past Monday to see how those expecting the world to end in less than a week would spend their valuable air time. Besides playing a lot of music, they had a vignette on how to help your children to stop focusing on the needs of today and instead look further into the future at bigger things like college and career, and they even had a radio appeal for more financial donors to help keep the radio station broadcasting. I found all that to be very odd. Less than a week before the demise of the world and Family Radio is worried about finances to keep the station on the air and concerned about telling you how to get your kids to focus on their future? And then there was the music. I don’t know about you, but if I knew that Christ was returning for His bride in less than a week, I’d be using the airways to deliver the Gospel message of repentance and faith, not playing music. I wonder why the nonchalant approach toward such an impending day of doom. Do they not even take themselves seriously? Could Christ return on May 21, 2011? Absolutely, for He told us to keep watch because He will indeed return. But not only did He say that no man knows the time of His return (Matthew 24:36), He also said He will come at an hour when we least expect Him (Luke 12:40). Wondering about the fate of your pets after Judgment Day? Well, for $135, a loving atheist will care for your animal if you’re not around anymore. Eternal Earthbound Pets offers a service to rescue and take care of pets once their owners have been taken away to the heavenly realms. Though doomsayers say this Saturday will be the latest day of reckoning that’s not expected to leave animals behind either. Bart Centre of New Hampshire, co-owner of the pet business, launched it in June 2009. 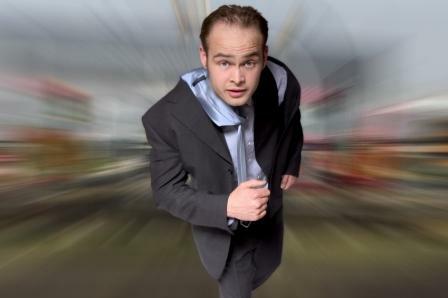 He has zero belief in Judgment Day, but began to see an increase in sales inquiries in December, which, he believes, is related to Family Radio’s heavy marketing campaign around the May 21 date. The retired retail executive said he has sold 258 contracts so far. ABC News also has a brief piece by Calvin Lawrence Jr. (reprinted below) on past judgment days that have come and gone, including predictions by the Jehovah’s Witnesses and Chuck Smith (yes, the Chuck Smith of the Calvary Chapel™ franchise). The Bible couldn’t be clearer, right there in the Book of Matthew: chapter 24, verse 36. But doomsayers have sworn since at least Roman times that they’re better sourced than the angels themselves, boldly trotting out predictions down to the day for the Final Judgment, when, Christians believe, Jesus will descend to earth and set off a chain of events resulting in the end of the world and a new heaven. May 21, 2011, is the latest attempt to get a jump on Judgment Day, courtesy of Oakland, Calif.-based Family Radio, a nonprofit evangelical Christian group. And, assuming we’re all here to follow up, it will make a nice addition on May 22 to this random list of predicted Second Comings we’ve survived so far. 1. 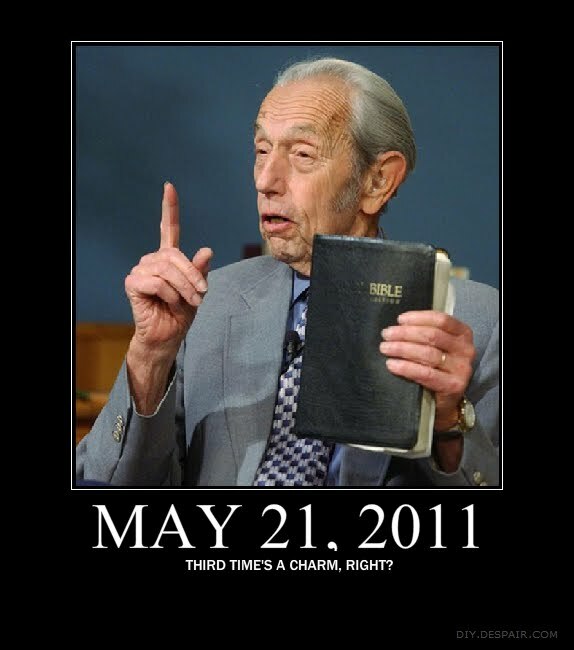 Let’s start with Family Radio, whose president, Harold Camping, predicted the End of Days before: Sept. 6, 1994. Camping had been “thrown off a correct calculation because of some verses in Matthew 24,” a company spokesman told ABC News this month. The Christian radio broadcaster is apparently more confident this time around, spending big bucks on 5,000 billboards, posters, fliers and digital bus displays across the country. 2. Edgar Whisenant didn’t get it right the first time, either, when he predicted a mid-September 1988 Rapture, even publishing the books “88 Reasons Why the Rapture Will Be in 1988” and “On Borrowed Time.” No Apocalypse, no problem. The former NASA engineer simply pushed his predictions off to three subsequent years and wrote books along the way, none of which reportedly sold as well as the first two. He died in 2001. We’re unable to confirm where he’s awaiting the big day. 4. In the century before, renowned New England Baptist minister William Miller triggered what ultimately became known as the “great disappointment” after his failed prophesies that Christ would return sometime between March 21, 1843, and March 21, 1844, and then on Oct. 22, 1844. You might have missed it, however, because the prophesy came to pass invisibly, he said, according to the Christian Research Institute. Smith was wrong and has not only abandoned his prophesying ways but since has looked askance at others who have gone down that road. 7. The prophetic-sounding year 2000 inspired too many doomsday predictions to list here. Suffice it to say that, in hindsight, there was really no need to party like it was 1999. Sermon of the week: “The Deity of Christ – An Examination of the Verses the Cults Use” by Charlie Campbell. Your sermon of the week is one that defenders of the faith are going to love. The Deity of Christ – An Examination of the Verses the Cults Use by Charlie Campbell examines the eight most commonly used verses that Jehovah’s Witnesses employ to attack Christ’s deity. Campbell does a fantastic job of presenting the texts as the Jehovah’s Witnesses do (twisted and out of context), then he goes point by point as he dismantles each of their misrepresentations using the light of Scripture.